Gr Vending offers the Quinzee vending machine with the first filling for free and a total profit of EUR 1600 for orders till 31/5. 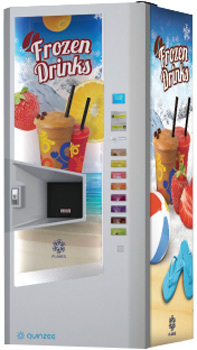 The Quinzee™ is the world’s first fully automatic vending machine for frozen textured drinks. Quinzee’s unique, proprietary drink preparation process uses instant powders and syrups in order to prepare a large verity of frozen drink servings in an on-demand, fully automated process. Frozen drinks (granita, slush drinks / smoothie’s) has long been popular around the world, with favorable flavors like iced coffee, iced lemonade, frozen fruits smoothies, frozen yogurts, frozen ice tea etc. which are usually prepared and sold via counter top granita machines. The Quinzee machine finally enables the automatic vending of such beverages, automatically, in a free-standing machine concept. Our machine finally opens a new and desirable market segment for vending machines operators, as on-the-go users can enjoy a wide verity of frozen drinks in various locations from an automatic machine! 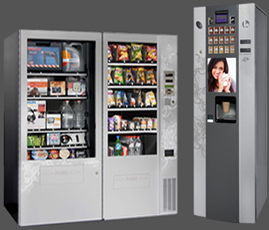 The Quinzee was designed and tested by experienced vending machine operators and industry experts. The concept and goal is to bring cutting edge innovation into the industry, leaving the day to day operation a simple task, similar to common hot/cold beverages vending machines. A 220cc serving preparation process takes about 50 seconds and includes an automatic dispensing of a cup and a straw followed by the frozen drinks flavor chosen, after which the machine is immediately ready for next drink’s flavor order. An automatic cleaning cycle is integrated as well. The Quinzee offers a selection of 8 frozen drinks flavors made instantly form a verity of 4 Bag-in-a-box syrup packs and 4 powder canisters (mixture of flavors is easily set).